SPARTA — In their final year as part of the Mid-Ohio Athletic Conference, the Northmor boys’ basketball team claimed at least a share of their first-ever league title in dramatic fashion. Competing at Highland on Thursday, after trailing virtually the entire game, the Knights rallied for a 42-41 win on a Tyler Kegley free throw with 1.8 seconds left. Northmor had taken a late lead, but a Mack Anglin three-pointer with 34 seconds on the clock had tied the score at 41. Highland would then get the ball back and had multiple attempts to score, but could not convert. Kegley finally grabbed the ball for Northmor and was fouled. After missing his first attempt, he drained the second and, shortly thereafter, the Knights were celebrating the win and a share of the title. A big part of the reason for Northmor’s frustration was the defense of Highland. The Scots rode six points by Mack Anglin and four by Quin Winkelfoos to a 12-8 lead after the first quarter. Highland continued to hold their advantage throughout the second quarter. After Winkelfoos and Brock Pletcher traded three-pointers to open the period, the Scots got five straight points from Kaleb Phillips to jump out to a 20-11 lead. Back-to-back shots by Kyle Kegley and Alijah Keen brought Northmor within five, but they would not be able to get any closer and trailed by six at the half. After watching his team shoot 77 percent in winning at Northmor earlier in the year, Scot coach Chris Powell simply felt things didn’t work out for his offense in the rematch. While the Scots didn’t get much going offensively in the third quarter, their defense did the same to Northmor, as both teams only scored eight points during those eight minutes. Four points by Tyler Kegley and two each from Keen and Pletcher brought the Knights within a 27-26 score, but Highland finished the period with a three-pointer by Phillips and a basket from Winkelfoos to lead by six going into the fourth. A basket by Phillips to open the period put Highland in front 34-26, but Northmor rallied with four points by Keen and two from Johnson to close within two at the 6:17 mark. Over the next three minutes, both teams only got two points each, something that bothered Powell due to his squad missing four free throws in that span. Northmor found that lifeline in the final three minutes of the game, getting two free throws each from Tyler Kegley and Pletcher, as well as a Kyle Kegley basket to finally move in front by a 40-36 score. 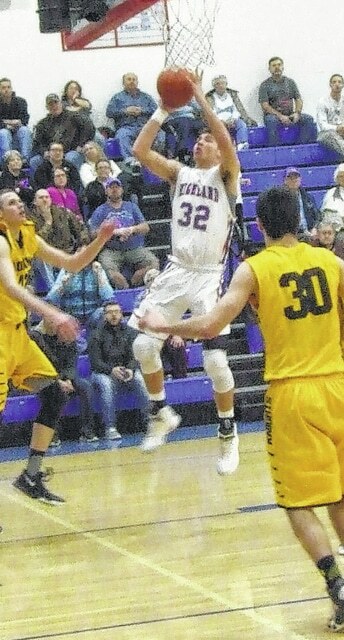 Highland would get two foul shots from Thomas Wheeler and a three-pointer by Anglin to tie the score at 41, but Northmor won in the final seconds to finish with at least a share of the title, depending on the result of Saturday’s game where Highland visits Cardington, who is 10-3 in the Blue, as compared to Northmor’s 11-3. For the Scots, Powell had hopes of his team being in the league title race, as wins over Northmor and Cardington would have placed them in a tie. Now, they have to try to rebound against the Pirates to take positive momentum into the postseason. For Northmor, Keen finished with 16 points, Tyler Kegley had 10 and Pletcher added eight. Highland got 14 from Phillips, 12 from Anglin and nine by Winkelfoos. Tyler Kegley, showing attempting a shot in the above photo, hit the game-winning free throw with under two seconds remaining on Thursday to give Northmor at least a share of their first MOAC boys’ basketball title. Mack Anglin puts up a jumper for Highland in action from Thursday. Demetrius Johnson puts up a shot for Northmor in their 42-41 win at Highland. Highland’s Quin Winkelfoos gets inside for two points against Northmor.